Follow the link for more of my writing on Jean-Marc Vallée's upcoming Big Little Lies. This essay will examine the writing of Jacques Audiberti that appeared in Cahiers du Cinema from 1954 to 1956 and how his writing represents a unique approach to cinema for his period and how he perceived it to evolve over the two years. The film writing of Audiberti, who was born in Antibes in 1899, is unique as it emerged from experiencing its bourgeoning half-a-century first hand as well as coming to it from a journalist, novelist and theatre background. Audiberti was especially important at Cahiers, perhaps more so than other guest contributors, as he would leave a profound mark on François Truffaut, who had asked him to contribute, and who would be inspired be his prose, published work, world-view and friendship for his entire life (for example, one of the portraits in La Chambre verte is of Audiberti). Audiberti’s seventeen billets in Cahiers were a regular series of article that were subjective ruminations on what were topical films, debates, attractions, technological developments along with descriptions of personal experiences and memories. This research is important for providing a framework to better understand the films of the fifties period and how they were received at Cahiers and to the analysis of one individual critic and how they were able to impose themselves at the magazine. The keys Audibertien ideas that will be analyzed are his thoughts on cinema as expressed through his prose, the importance of actors and especially actresses, cinema memory, his theoretical understanding of cinema, and his filiation to Truffaut. The French film critic Noël Herpe describes Audiberti’s writing as, “Through reading his articles… it’s confirmed that only cinema could have aroused such a singular form of criticism through its archeological depth. What is unique is the variety of subjects that he involves and the freedom he allows for imagination” (Positif, October 1997). Audiberti’s prose is that of a personal writing whose film analysis emerges from his own relationship to the cinema screen as he has experienced it. Though there are some more important films that are analyzed through multiple paragraphs what Audiberti prefers discussing are the actresses on the screen, small details, humor and all of their relationships to the world. It is a profoundly French specific form of writing that brings to it its own cultural and literary heritage as well as references to its urban spaces and social practices. Audiberti first contribution was in the Christmas 1953 issue which was dedicated to La Femme et le Cinema and his piece was entitled Greta, Marlene, Ninon. The quality of this essay led to Truffaut asking Audiberti to regularly contribute a series of articles that were to be his perpetual chronicle about the women, actresses and heroines of the cinema as he experienced them. Audiberti would agree to the project thought he insisted that the theme would be broader then just that of women, which he thought would be too limiting (Le dictionnaire Truffaut). These billets would be prioritized at Cahiers by usually being placed at the front of the magazine. But actresses would still be a subject that inspired several of Audiberti’s following contributions. In his first essay he describes seeing Greta Garbo in person, “I saw her, in full form, as impressive as you would imagine her to be, from the back, on Boetie street, from Miromesnil. She had beautiful black hair, was carrying a straw bag and was dressed in maroon” (Cahiers, Christmas 1953). Marlene Dietrich seduced him in Der blaue Engel. There would be more articles on Garbo, Joan Crawford and Audrey Hepburn (Billet VII). He especially liked Crawford in Johnny Guitar, Sophia Loren would charm him in Pane, amore e... and so would Ninon Sevilla in La Professionnelle. The importance of this is how Audiberti theorizes how the faces in cinema that one has seen over the years have a profound impact on personal memory, and how it is one’s life that one reflects upon when they see and think about those faces. Though he got frustrated with unsubtle overacting and expressed his disappointment with Curd Jürgens work in Helmut Käutner’s Le Général du Diable (Billet XVI). The attention Autiberti gave to the different roles played by the different actors, highlighting their strength and weaknesses, and how a filmmaker used them was in a way anticipating star studies. Audiberti’s writing is full of what Annette Kuhn would later describe as cinema memory as it springs from remembered images, situated memories and memories of cinema-going. Audiberti, a figure who had lived through the history of cinema, represented someone who had an authoritative perspective onto it. The cultural memory of an intellectual cinephile for the epoch emerges through Audiberti’s articles. There were at first the serials from his childhood, the classic silent films of the twenties, the two world wars, to the emergence of television. Audiberti’s personal biography and how it intersected with history are all parts of his writing repertoire. On Battleship Potemkin, “I haven’t seen it for thirty years, when we used to take the taxi-cab to Ursuline as if we were mythological Christian figures on a rite of passage. Seeing it again reanimated into me who I was in 1927 and the context of those times” (Cahiers, July 1954). On eros and cinema, “In the small electronic game shops that are still operating in Pigalle there were two Edisonian kaleidoscopes, where through its binoculars you could watch, after putting twenty francs into its slot, things like Nuits de noces and Folle passion and so on. This was before the war...” (Cahiers, December 1954). These are just some examples of how his writing was personal and how cinema memories were essential to it. Audiberti, as an older figure similar to André Bazin and Jacques Doniol-Valcroze at Cahiers, also theorized on the uniqueness and medium-specific qualities of cinema. He would cite how cinema was built upon the other arts (e.g. the novel, painting, theater, radio) and describe how it would evolve with technological developments from sound, color, and larger screen formats. For Audiberti, technological developments only prolonged the trance-like anomaly that it instills in the spectator that was there since its origins. 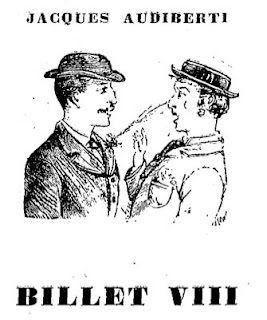 Cinema could, according to Audiberti, “allow man to double himself. He would become a specter in front of the celestial gazes of those on the screen. He becomes, more than himself, enriched, free and strong. It was through them that his fullest life resided” (Cahiers, Christmas 1953). If François Truffaut, who was born in 1932, and the ‘Young Turks’ represented the emerging voice and taste at Cahiers during this period, then Audiberti was of course on the side of the older generation at the magazine. As an only child from a troubled home, Truffaut would seek father figures in older kindred spirits and Audiberti was a prime candidate for this (even as early as 1951, Truffaut would admire Audiberti’s Le Maitre de Milan so much that he would send his copy of it to his childhood friend Robert Lachenay from prison). So event though the two had different thoughts on what constituted an emerging modern cinema there was still an important filiation between them. Audiberti’s taste included the films of Henri-Georges Clouzot (Les Diaboliques), Federico Fellini (La strada) and Max Ophüls (Lola Montès). He also admired some American films (The Barefoot Contessa, Scarface, The Big Knife), Mexican and Italian ones. Tuffaut, who had admired Audiberti’s film criticism in Comoedia during the Occupation, would get inspired by his unique personal prose when he would write his first critique in Cahiers on Sudden Fear, Les extrêmes me touchent (Cahiers, March 1953). 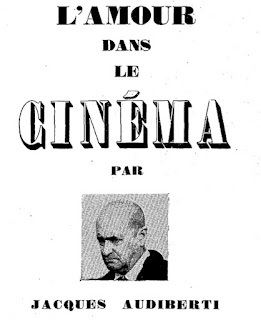 This survey of Audiberti’s writing at Cahiers illustrates how through the analysis of multiple texts by a single author a unique theoretical understanding of cinema could be expressed, the importance of film history to the magazine, and how there could be there a possible filiation between two different generations. The historical distance between the period that Audiberti was writing in to now has already led his work being studied and appreciated. There’s an association for him, a literary prize, a published volume of his film writing (Le Mur du fond) and he’s contextualized in La critique de cinema en France. For Audiberti cinema was: le pensé d’un spectator devant le blanc et noir de l’écran dans une salle obscure. How would that look like when the world has gotten a lot more complex and the whole infrastructure of cinema has changed? Kids in the Hall Book Launch ! Don't be a snob ! Come to the launch of John Semley's new book on The Kids in the Hall at The Royal at 8PM on Thursday!